Our innovative SmartTop mechanism quickly folds a monitor, keyboard and mouse into the desktop creating a secure and flexible solution. 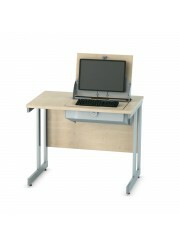 Popular in the training and education sector the SmartTop double cantilever frame offers strength and stability. Optional single and double CPU stands area also available.